Now it is time to compile Caffe from source. Solution Explorer window when Caffe is loaded. To build Caffe Python wrapper set PythonSupport to true in .\windows\CommonSettings.props. Download Miniconda 2.7 64-bit Windows installer from Miniconda website. Install for all users and add Python to PATH (through installer). copy folder <caffe_root>\Build\x64\Release\pycaffe\caffe under <python_root>\lib\site-packages. To build Caffe Matlab wrapper set MatlabSupport to true and MatlabDir to the root of your Matlab installation in.\windows\CommonSettings.props. add <caffe_root>\Build\x64\Release to your system path. Set the correct GPU Architecture by editing the <CudaArchitecture> tag. In my case, I am using a GTX 770 graphics card and I am good with these options: compute_30,sm_30 You can add pairs of compute _xx and sm_xx architectures separated by ‘;‘ characters. If you are not sure what shader model and compute capabilities your graphics card has, you can learn more at nVIDIA’s specification page for your graphics card. Give the following path for the <CuDnnPath> option: C:\Program Files\NVIDIA GPU Computing Toolkit\CUDA\v7.5 because as you can see further more in this file, it always appends \cuda\ to this directory. Now, make sure that your build mode is set to Debug and the target architecture is set to x64. Then just press F6 or from Build menu select the Build Solution option. After about 20 minutes (on a Core i5/4670) you should be done! At the end of build process, the resulted executable and library files will be generated in C:\projects\caffe\Build\x64\Debug folder. Now you can start using Caffe! I also recommend to add this directory to your Path environment variable. I am planning to run a simple image pattern recognition using Caffe. If I succeeded, I will add a tutorial here in my website! If you faced any problems, let me know in the comment section or in the dedicated forum topic. caffe, cuda, cudnn, deep learning, feature extraction, gpu computing, machine learning, neural networks. Bookmark. Thanks a lot, this helped me to install caffe (I was not able to do it from other repositories which claim to be the windows port). I do not have nvidia graphics card so I went CPU only. Glad it helped. I recommend running caffe with the help from gpu, because using only the cpu will make complex projects take forever! I’d like to thank you for this quick but expressive guide, it was really helpful. I’d like just to ask something, does this port support the newest version of CUDA (8.0) for Pascal architectures and CuDNN 5.0 or 5.1? Thanks again! Caffe can be compiled with either Make or CMake. Make is officially supported while CMake is supported by the community. I did not have any success on Windows to build using CMAKE, I always got lots of errors in CMAKE. If you know the correct procedure please let us know! Thank you very much for the nice explanation. 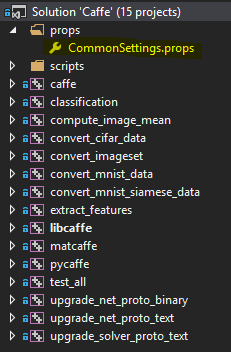 You need to create some layers to train the classifier, there are plenty of examples provided by caffe! just check those out. Please help me out, as I have been trying to build caffe since last week. I think this is a NuGet error, perhaps you have the wrong version! I think you better download standalone .exe of NuGet and try again…I cant remember but I think version 3 or 2 should work. Then pass the location of new downloaded NuGet.exe into the build file. Your explanation is very helpful. but I get error in Project\Caffe\windows> Nuget restore Caffe.sln …. . It says Failed to load msbuild Toolset. Hi, as far as I remember you should download the standalone executable of nuget, version 2 or 3…try both! That is a Matlab specific error…usually it means something is wrong with path to a library or something…. Maybe you have to change the “mex -setup” in Matlab. But I still have the error when build caffe.sln. What I should do Saeid? I have installed caffe CPU only with (Python_support) on my Windows 7 successfully. where can i find Nuget V 2.5? i can not install on windows. If it is possible for me to install with teamviewer.